I have listed a new property at 3082 LAUREL ST in Vancouver. Private rooftop patio with 360' views and bright, airy vaulted ceilings are just two of the countless luxury features of this contemporary Upper Fairview city home. This reverse plan 2 bdrm/ 2 bath townhouse truly has it all. Two good sized bedrooms, each with its own full bath, and a living space you can actually live in! The vaults make the already generous living/ dining area feel larger than they are. The chef inspired kitchen features contemporary flat panel cabinetry in a mix of high gloss white and wood grain finishes as well as an over sized prep peninsula, eating bar and large pantry with custom shelving. 1 parking and HUGE 6'10" x 9'11" storage room make this one the whole package! No rental restrictions. Open Sat/ Sun April 7 & 8 2-4pm or by appointment starting Fri April 6. Please visit our Open House at 58 870 7TH AVE W in Vancouver. I have listed a new property at 58 870 7TH AVE W in Vancouver. I have listed a new property at 1001 1068 BROADWAY W in Vancouver. 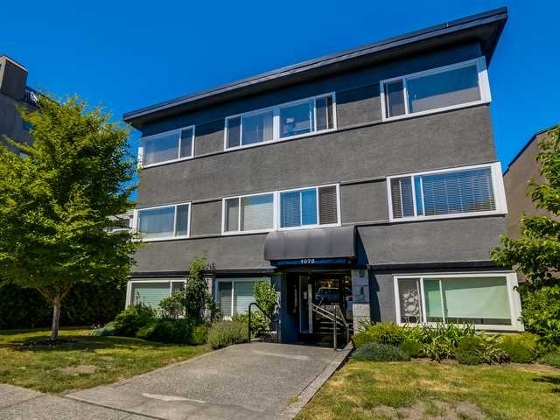 I have listed a new property at 1001 1068 Broadway ST W in Vancouver. THE ZONE, a highly desirable building, built in 2009 by Redekop Krocker. A spacious & open 1 bedroom & den layout in a quiet side of the concrete building. Quality finishes throughout: granite countertops, stainless steel appliances, laminate flooring. Exceptionally well laidout, with no wasted space. 1 parking spot & 1 storage locker are included. There is party room, gym and garden area with playground. A brilliant locationsteps from VGH, Restaurant & shopping along Broadway, Cambie St. and Granville St., and public transit & skytrain station. This home is perfecct for a 1st time homebuyer or investor. Please visit our Open House at 1507 1068 BROADWAY W in Vancouver. I have listed a new property at 1507 1068 BROADWAY W in Vancouver. Sub-penthouse view home with sweeping views of English Bay, City, and Mountains! This 2 bedroom 2 bathroom home occupies the North East corner of the 15th floor, enjoy the patio offering unparalleled views for relaxing or entertaining on. Welcome to an meticulously laid out home with the 2 bedrooms nestled on opposite corners, a well appointed kitchen with a stainless steel appliance package; floor to ceiling windows in the living room to enjoy the city lights; A small dedicated office in the enclosed balcony and sizable insuite storage. The Fairview location is steps to amenities and services and a few blocks to the seawall Granville St. and Cambie St. entertainment hubs. 98 Walkscore. 2 parking and storage locker. I have listed a new property at 210 2201 PINE ST in Vancouver. Spacious and beautifully updated 3 bed plus den with over 1600 sf. 1 level living with generous room sizes for house size furniture plus tons of closets and storage. Recently updated with gorgeous cherry H/W floors, brand new kitchen with custom cabinetry, quartz counters, glass backsplash, Italian tile floors and S/S appliances. 2 spa-like baths with new cabinetry, quartz countertops & designer tiles with a soaker tub plus separate shower in the ensuite. 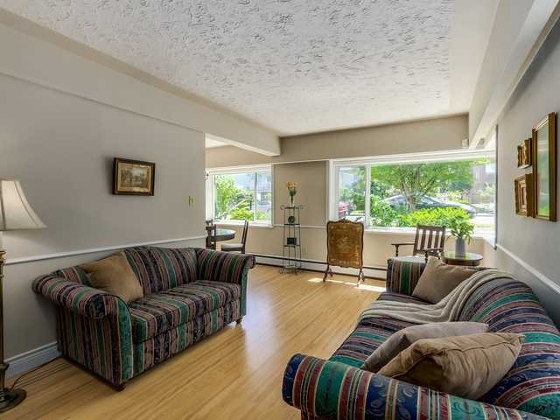 This N/W corner suite offers a private outlook with views to the mountains on one side & garden courtyard on the other. Well maintained building with amazing amenities including pool, hot tub/sauna & gym. 2 pkg + 1 locker. OPEN JUL 21 5.30-6.30, JUL 23/24 2-4 & JUL 26 10.30-12. Fantastic Penthouse in Fairview for sale! Bright spacious penthouse condo in Fairview first opens this weekend. This beautiful top floor unit features 16' vaulted ceilings in the living room and skylights in the dining room and bathroom. The sun drenched balcony is perfect for relaxing with your morning coffee or an after work glass of wine. I have listed a new property at P4 2885 SPRUCE ST in Vancouver. Let the sunlight in! This bright and beautiful top floor unit features 16' vaulted ceilings in the living room and skylights in the dining room and bathroom. Large bedroom can easily accommodate a king size bed. Kitchen appliances and countertops have been updated and treated with care. The sun-drenched balcony is a perfect spot for relaxing with your morning coffee and an after work glass of wine. Bonus: this is one of the few units in the building that has in-suite laundry. Includes 1 parking spot and 1 storage locker. Fairview Gardens is a pro-active strata, and has undertaken many upgrades, including parking membrane, balconies, piping, lobbies, and hallways. Elevator to be done this year and has been paid for. Open Houses, Sat/Sun, July 16/17, from 2-4pm. I have sold a property at 3021 LAUREL ST in Vancouver. 3021 Laurel St, Vancouver, BC, V5Z 3T6, FOR SALE, Spectacularly renovated, 2 storey T/H, SW facing corner unit remodeled down to the studs. This stunning & rare property has a great open layout w/ 2 bed and 2 bath, incl high end laminate floors, window coverings, closet doors, crown moldings, baseboards, paint, & custom kitch cabinets. New S/S app in kitch, matching front end W/D, granite counter tops w/ under mount sink & gorgeous slate tile extending throughout the unit., matching backsplash, rock wall & gas F/P. Amazing private concrete patio, balcony & backyard! Completely rain screened w/new roof. Parking and storage incl. Close to VGH, Children's hospital, RAV Line, DWTN, Cambie, Broadway, schools & transit. Pets allowed. Rentals w/restrictions. Potential for a family child care license up to 5 children. Seller wishes to rent back as a tenant for at least one year.